Starring: The vocal talent of Nicolas Cage (Astro Boy), Ryan Reynolds (Green Lantern), Emma Stone (Marmaduke) and more. Dreamworks Animation is often hit-and-miss for me. I liked Shrek and LOVED How to Train Your Dragon, but Puss in Boots, Shrek 2-4 and Rise of the Guardians were merely “just okay” to plain boring for me. 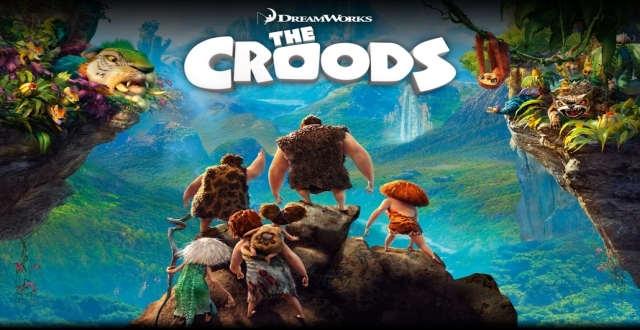 Nothing in the promotional materials for The Croods made me feel that I just couldn’t miss this latest family adventure (except for, perhaps, the pretty cool trendy sloth who was probably my favorite character). A story filled with multiple angles such as a father fighting to be the source of all for his family, the avoidance of everything new, a teenage girl hoping to find her own fate along with the evolution of acceptance all cover the pallet of the plot…oh yeah, and the world is ending, so…there’s that! A bit too complicated overall but there is a decent amount of blending and extra delights (such as fun storytimes, egg-hunting football and fun mother-in-law hatred) that I didn’t mind. Families will enjoy watching this movie together. One of the funnest aspects for me in this film (aside from several hilarious side-phrases from the son, Thunk, mentioned in the background of the movie) was watching it in a theater where the laughter of children filled the air. My own laughter joined theirs in several parts such as a moment in which a prehistoric dog is taught how to rollover. I laughed so hard at this guy’s “Rollover lesson” part! A bit surprising is how the story goes from “Little Mermaid” meets “Land Before Time” and turns all “Armageddon-ish” towards the end with a deeper/misplaced drama than expected. 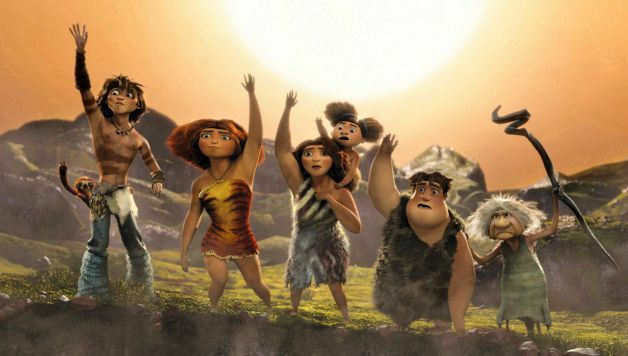 However, the beauty of the film is three-fold: (1)its message of family/acceptance, (2) the characters giving something for each family member to relate to and (3) the fun usage of modern elements mixed with caveman carrying-ons! (that scene did nothing for me, but got tons of laughs in the theater)…but, it still was fun. Watch it with your family and come back and let me know who your favorite character or what your favorite part was! Thanks for reading! Happy Watching! Next Movie News Monday for March 25, 2013. Encouraging review. It sounds like you and I had the same approaches to this film. It really didn’t interest me but it certainly has the attention of my kids. Now it sounds like something that we could enjoy together. hahaha. me too, Tim. me too! The fact that it has both Nic Cage and Ryan Reynolds in it turned me off from seeing it but I’ve heard some positive reviews from others. I may as well check it out. Nice review. yes, I can def see their inclusion keeping you from checking it out. I hesitated and went in with proverbial arms crossed. left with a smile on my face! thanks for commenting. You’ll have to let me know your thoughts when you do see it. Haha. I am at work but I had to respond to this. It couldn’t wait. Lol. Well, I didn’t intend to make you out to be a liar and I still won’t call ya one, BUT…it is neither great nor terrible! I can’t wait for you to see it now! Nice review! I was really unsure about this one. Looks like its taking a pretty hard hit at the box office. I didnt think it was complicated at all. LOL. If anything, this flick was pretty simplistic! I appreciated the fact that it aimed itself more squarely at children. The Pixar effect (where animated films get aimed at ALL audiences now) needs a counterbalance. 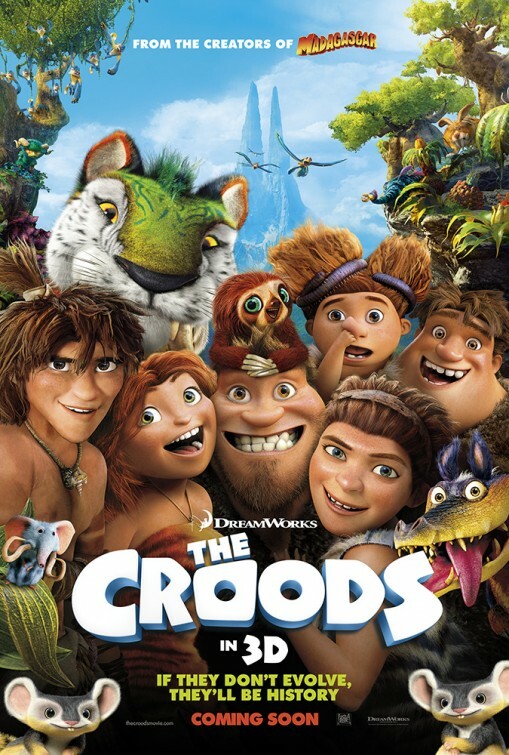 The kids in my theatre were cracking up too, so… good on “The Croods”! complicated in that it put a bit too much: end of the world, father/daughter, father jealousy, new boyfriend’s family storyline, drama of self-sacrifice etc…it was a lot coming at ya. Not bad, but still a lot. I felt it was a bit too much anyways. But I still liked it more than I thought I would. It sounds like you liked it more than you should. Going with a movie like this, the challenge is a proper balance of staying within the world but also having relatable elements. From your review, it doesn’t sound like this one struck that balance, especially that shoes clip. A little sweet, a little cute, a little fun, and a little dark. But still a nice mixture of them all. 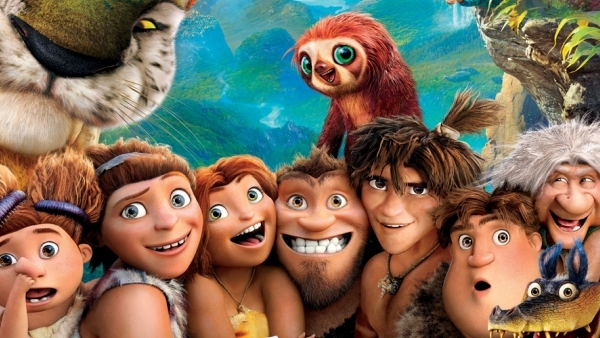 Good review T.
Its a silly fun film that the kids will love. Good review.